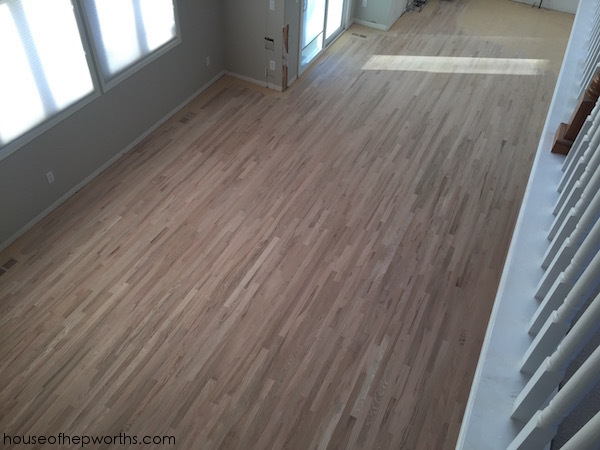 As you are probably aware, because it’s literally all I’ve talked about for weeks… we recently refinished all the wood floors on the entire first floor of our house. And when I say “entire first floor”, I mean it. 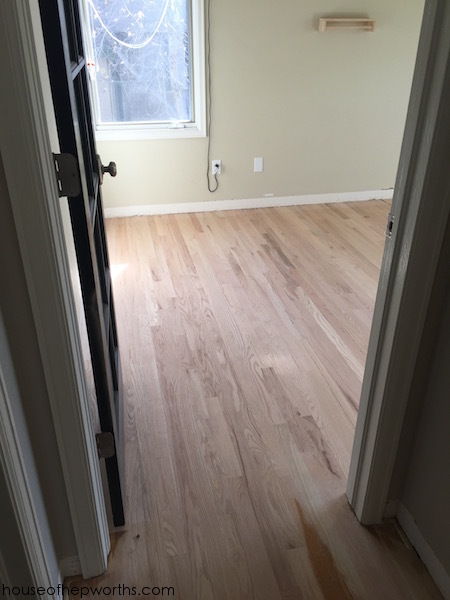 The only rooms on the main level that didn’t get new hardwood floors are the bathroom and the laundry room. 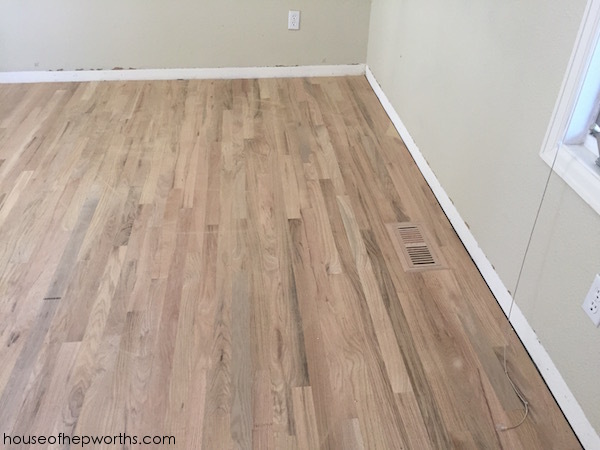 Every closet (2), every living space (5 – formal living, family, dining, office, kitchen), and even the foyer all got new hardwood floors. Hell, even the staircase got new hardwood floors. And the most incredible, and also worst part? We didn’t move out when we did it. We packed everything up, but we literally lived in this house through the chaos and dust storm. If I ever get lung cancer, it’s because I breathed in this mess for weeks on end. 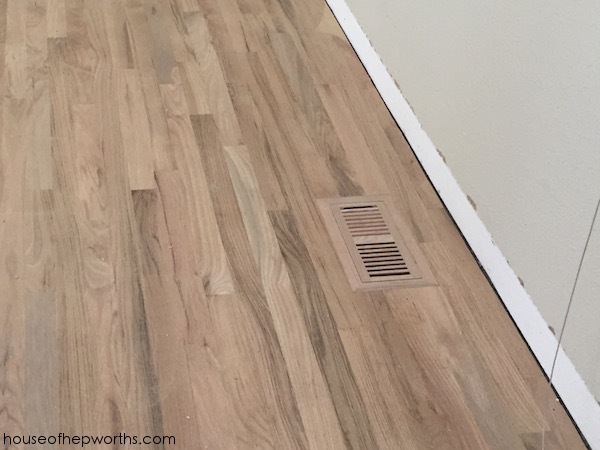 In my last post, Refinishing hardwood floors part 1 – weaving new flooring into existing, I shared the process off adding new wood flooring with the old for a seamless look. Today is phase 2! Sanding day. Sanding day should have happened once, over a period of several days, but due to some unfortunate mess ups, we ended up living this three times! I will definitely dive more into that drama in one of the next few posts about the floors. Today though is a happy day! 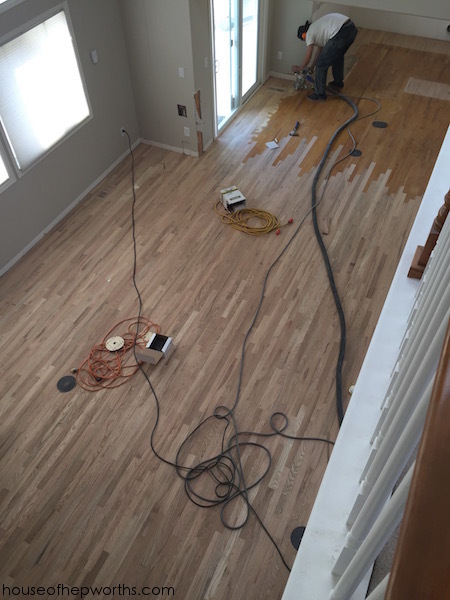 Once all the new flooring was weaved into the old, the crew started sanding all the floors. 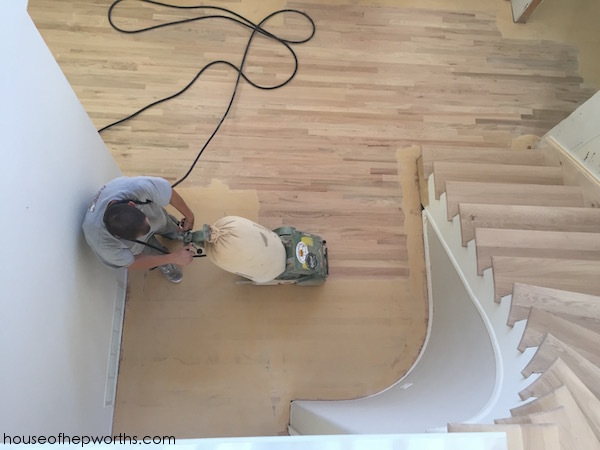 They used a combo of a hand-held sander around all the edges and a large push sander for the main areas. They were slow and methodical, double- and triple-checking their work to make sure it was perfect. 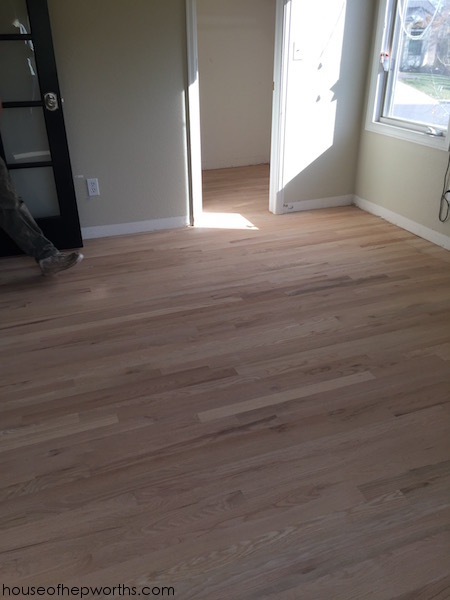 Here’s a shot of our old floors, half sanded, half not. 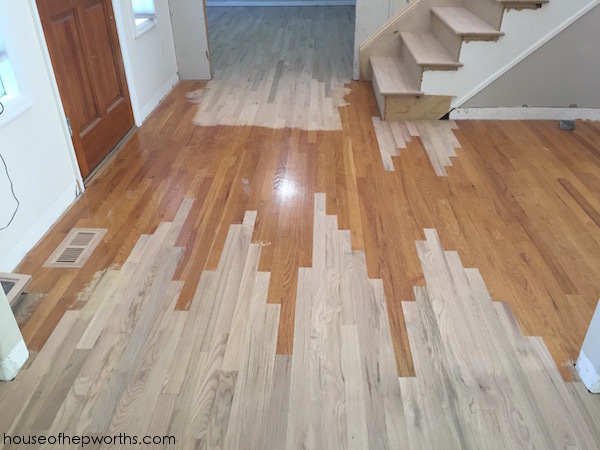 You can see the beautiful raw natural wood vs the orange stained wood from 25 years of sun exposure. I’m sure when the floors were originally finished they weren’t yellow’d, but over time the oil-based poly turned them into an orange resembling a bad self-tanner. 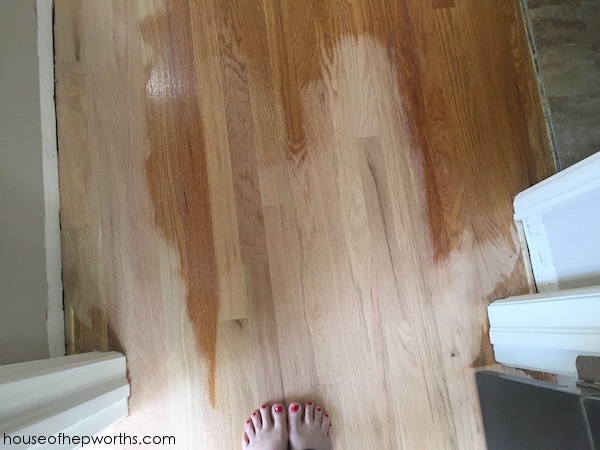 The floors looked so pretty when they were done sanding. I love the look of raw, natural wood. 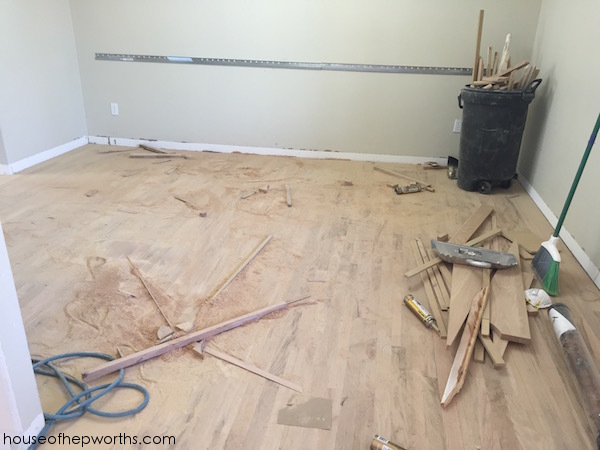 Seeing my office totally sanded made me feel so inspired to move back in and start creating things again. Oh the crafting that will be done in this room! The dining room ended up being the main hub for the crew. You can see the amount of dust was kicked up during this entire ordeal. 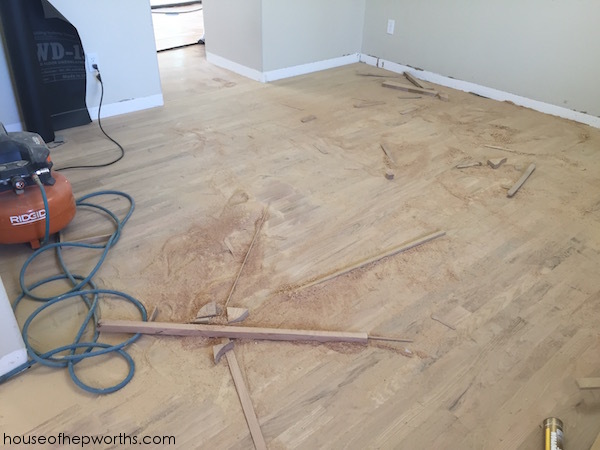 I won’t sugar-coat it; refinishing the floors was probably my top 3 worst nightmares. If I ever do this again (trust me, I won’t), I’ll only do it in a home that we don’t live in. 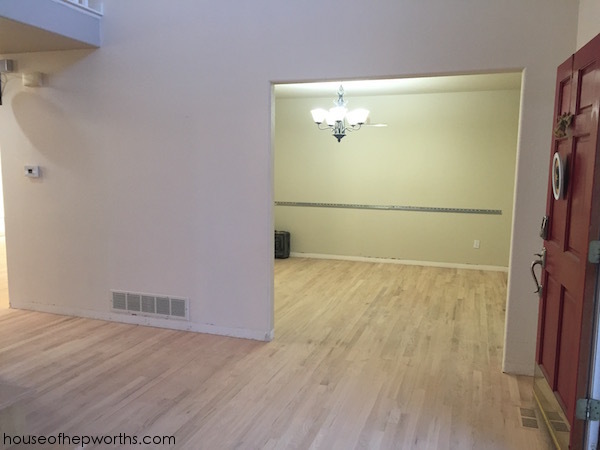 This picture is a bit deceiving though because the dining room is also where the stair guy did all his cuts for the new treads and risers on the staircase (I’ll show you the stairs in the next post). 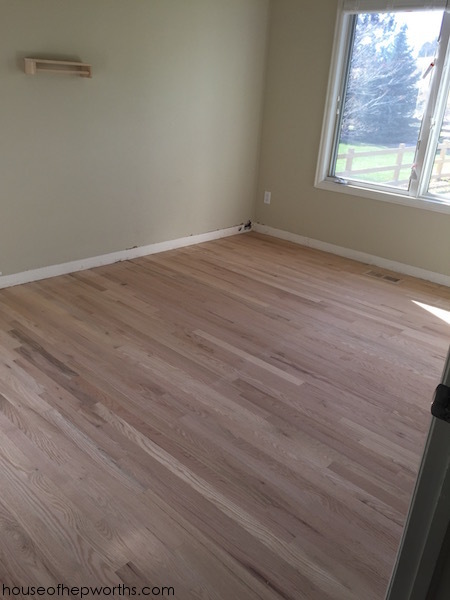 So, once every nook and cranny of this entire house was sanded, I was like, “LET’S GO GET OUR STAIN ON!” and they were like, “not so fast crazy lady,” and then they busted out the most giant can of wood filler I’ve ever seen. They took putty knives and by hand, on their hands and knees, proceeded to cover my entire first floor of my house with wood filler. The next day they came back and freaking sanded again. They earned every penny. 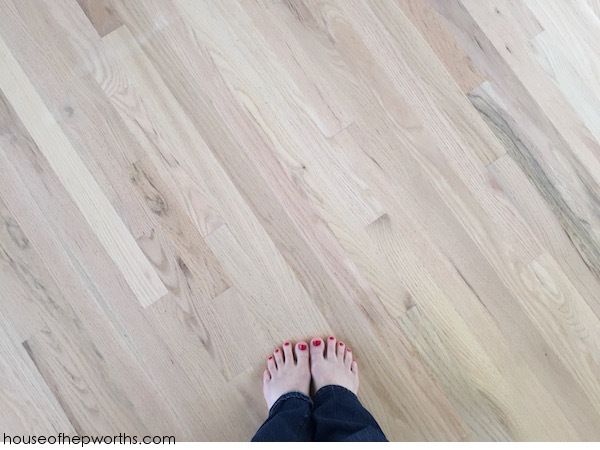 I thought the floors couldn’t look any prettier, but after the wood filler and sanding, they look like a million bucks. 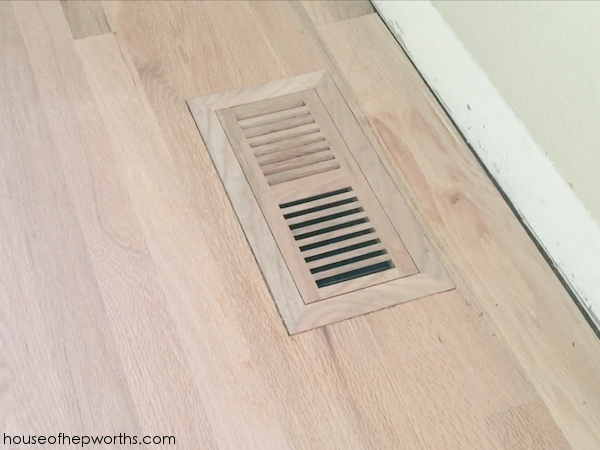 I guess this wood filler step is part of the process of wood floors. I had no idea. 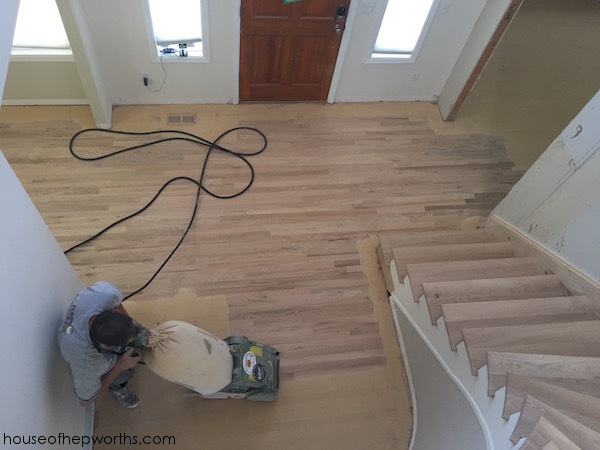 Before they can stain, they have to bring in the stair expert to do all the treads and risers, so next post I’ll share all about the stairs! Here’s a little sneak peek of the stairs. Looks like a great call to get this done. Oh, wow, you did such an amazing and hard job! Congratulations. The floor looks very good. 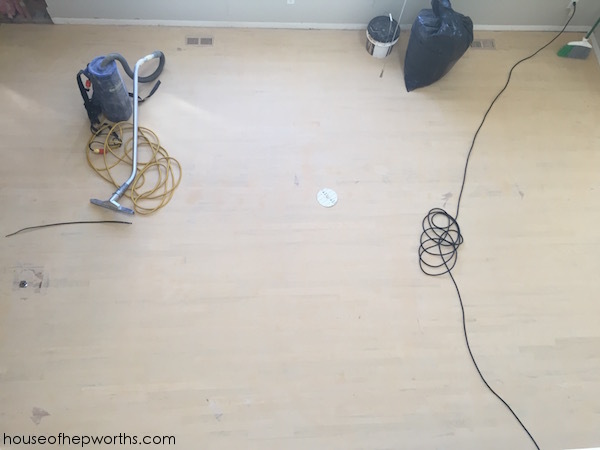 I’m thinking about sanding hardwood floor in our house too as it looks better, feels better. I also love the look of raw, natural wood. 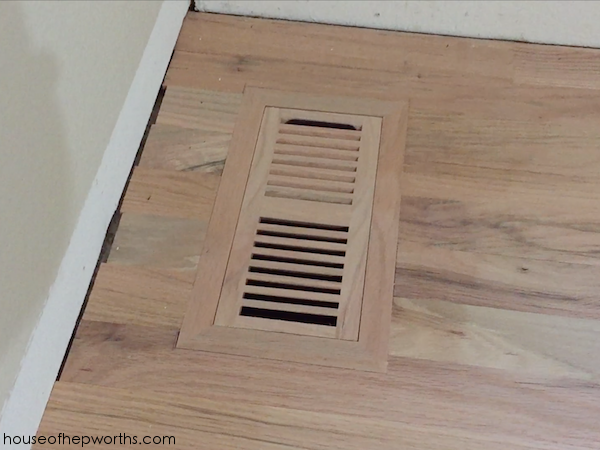 And as I know it also helps to hide dust so you won’t need to clean the floor that often. I mean, of course, you have to clean it, it’s just on that shiny floor you see everything, also every scratch. And I hate that laminate and these kinds of floors also can be very slippery. I remember that one time when my wife used some kind of spray product that had oils in it, and later that day she slipped and fell on the floor. Oh, but thank you for sharing your knowledge and experience. Love it! Also, thanks for stopping by and commenting! Wow, I mean, WOW. SOOOO beautiful! THANK YOU! Yes, we already stained it. I considered just putting a clear top coat on it but in the end we stained it a greyish brown which I am very happy with. I think I saw the flush mount vents like one time ever and it just stuck in my mind. They are so pretty.